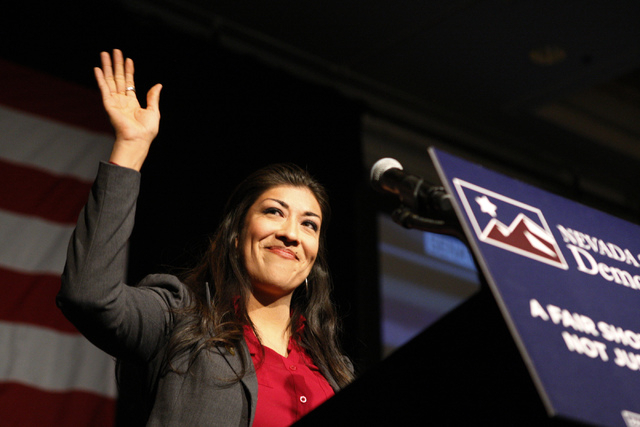 Harry Reid’s hand-picked candidate to run for lieutenant governor, Lucy Flores, turned out to be one very bad candidate, reflecting specifically upon the judgment of her benefactor and on the Democratic Party in Nevada in general. She got clobbered by Nevada voters in the statewide election last Tuesday. A number of factors were at work, but none were more important than she simply had nothing to offer the state’s voters in terms of deep-thinking, or experience or background. Reid and Democrats thought she’d be good simply because she had “the liberal story” that they think is so popular these days — a Hispanic woman, a former gang member, who had an abortion to turn her life around and become a lawyer and presumably became a productive member of society. Cry me a river. What voters said Tuesday to Reid, Democrats and Flores is that that kind of superficiality isn’t enough. You want to be elected statewide to a position that might put you in position to be appointed governor, then show us something. Unfortunately for Flores, there was nothing to see. She and Reid touted her abortion and her gang life as a bootstraps narrative. But at no time in the campaign did Ms. Flores expand upon her gang life. We know she got arrested for boosting a car, but what else did she do for which she was not caught? Did she hurt anyone? She had nothing to say. She would not even release her juvenile records. And as for her abortion, she at first actually tried to make it seem like that act was a positive step in her drive to make something of herself, which is an unusual position in the extreme to take. But after making the assertion, she again went dark on the topic. No talk about her abortion, lessons learned, or about the narrative in which she contends her sisters ruined — or at least made their lives more difficult — by keeping their babies. That was a mistake that Ms. Flores said she didn’t want to make. Look, teen errors and the choice of abortion is nothing to campaign on if you’re not going to expand upon the topics and serious discuss the decisions. Lucy Flores just used them as a campaign launch and then proceeded to run a horrible campaign on the issues. It was an embarrassing show all the way around. Couple the Flores disaster with Harry Reid’s inability to find anyone credible to run for governor, and it’s no wonder Democrats went down in historic defeat last Tuesday.